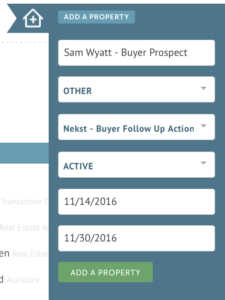 Use Nekst to follow up with Buyer and Seller Prospects before they become a client! STEP 3: Execute your daily tasks as they appear. Once the prospect becomes a Client/Listing/Pending, change the name of the property to “123 Main St”. Type = Pending Buyer. Action Plan = Buyer Closing Plan. Update your Start/End Dates. With this method, you will be able to track a client from first contact through closing and beyond! FOR NEKST PRO USERS ONLY: Want us to load a Buyer Follow up Action Plan in your account? Simply let us know in the comments below and we will hook you up!